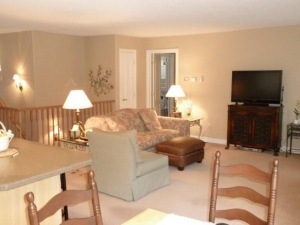 one of the larger condos, this exceptional end unit 1560 spacious sq.ft., 2+1 bedrooms, 2-1/2 baths, high end adult life style luxury california style bungalow is in the `raven hills` enclave. quality throughout featuring open concept family room & kitchen with island corion counters, hardwood flooring, six appliances, vaulted ceiling in dining room, gas fireplace, halogen lighting, custom blinds, gorgeous master suite with walk-in closets and large spa like ensuite, second bedroom or use as den/office, main floor laundry/storage, lots of cupboard space. 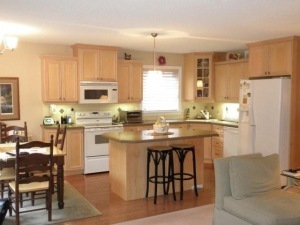 recently renovated basement with large bedroom, walk-in closet, 4 pc. bath, lounge room. 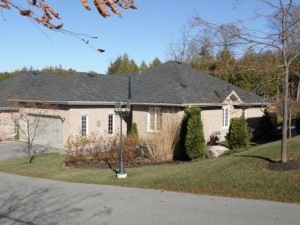 all backing & siding onto a beautifully private landscaped treed lot. why go through the building process when you have it all here. see brochure for more information.